History is a very strange subject to study, it is full of contradictions, makes one scratch his head and wonder just what actually happened. One has to understand that just because someone wrote an article in a newspaper, online, email, or a book concerning some random subject does not make the event true, nor does it make the facts as stated in the article correct. I guess you need to read all the information about a particular subject, and use the information to form your own opinion. The more I study I find that I need to study more. I often wonder just what did happen, I find that historical information is confusing. So many of the stories I was told in my youth did not happen the way I understood. The history thought in our public schools is biased, all too often outright lies. The 'New World' supposedly discovered by Columbus was known for hundreds of years before 1492. Columbus was a Jew from Italy, who was wanting to find a 'homeland' for the Jews. The discovery of gold in the 'New World' queilished this idea. The Spanish expelled the Jews from Spain in this era. There is evidence that copper was mined by the invaders from Europe long before Columbus. A glacial age is a period of long-term reduction in the temperature of the Earth's surface and atmosphere, resulting in the presence or expansion of continental and polar ice sheets and alpine glaciers. Within a long-term ice age, individual pulses of cold climate are termed glacial periods and intermittent warm periods are called interglacials. We are currently in an interglacial period that began 2.6 million years ago because the Greenland, Arctic and Antarctic ice sheets still exists. The period immediately preceding the first humans coming into Colorado was the Ice Age Summer starting about 16,000 years ago. The landscape changed dramatically and most of the large animals such as the mastodon, mammoth, camels,sloths, cheetah, bison antiquus became extinct. Before the glaciers started melting they were over one mile thick. The melting glaciers uncovered the mountains, eroded the landscape, and created new river channels. Glaciers are not sold ice as often thought, they often will contain enormous reservoirs of water that when released caused drastic erosion events. The melting of the glaciers caused a different climate, it would have been a lot more humid, there would have been a lot more rain and much more snow during the winters. The increased moisture would have resulted in a difference in the production of grasses and vegetation. The size of the grass seeds would have been much larger and numerous different varieties. As the global warming continued, the lakes and savannas formed by the melt waters from the glaciers receded. Over hundreds of years this area changed into the dryer desert climate, the larger animals slowly became extent. The early humans were forced to adapt to this climate change, instead of having the larger mammals to hunt for food and the bigger grass seeds and other fruits they changed their diet and utilized the less abundant sources of food or moved to better pastures.. In a gulch north of Owl Canon you can find cooking pits that were buried under 10 to 20 feet of dirt. A cooking pit is a small hole that was dugout in the ground, this hole was then lined with rocks. A fire was started in this pit, heating the rocks, after the rocks got hot, the charcoal was removed and the pit was filled with different grass seeds then covered over with dirt. A few hours later the dirt cover would be removed and the cooked seeds could then be consumed. Undoubtable this gruel was not very tasty, but provided some carbohydrates. Perhaps chunks of meat was also added to this gruel. In this same area is found where at one time there was heating fires which are flat layers of charcoal - campfires. Near this area a mammoth was found years ago. Once in a while you can find both Clovis and Folsom points exposed in the dirt, along with 'newer' points. Be careful not to stumble over your own bluff..
A good collection of old newpapers http://www.coloradohistoricnewspapers.org. December 1 through 5th,1913 Colorado was hit with the biggest snow storm in the history of the state. The storm started slowly and soon brought the "Eastern Slope" to a halt. Is to stay right here at home. 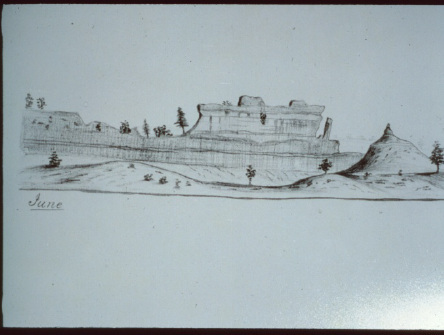 On June 23, 1850 William Quesenbury drew this picture of Steamboat Rock. Ties are timbers used in the construction of railroads, a normal mile of a railroad uses 3,249 ties which are spaced nineteen and one half inches apart. A nominal tie is 7" x 9" x 8' 6". Transporting the ties was a problem, there were very few roads in the hills. Some times a good stand of trees was found near a river, the ties could be floated down the river, such as the Poudre. This was known as a tie drive. It would be a sight to see. over 325,000 ties. There was also many other railroads being constructed during this era, requiring vast amounts of lumber, in addition to the ties. In the earlier years the ties were not treated to prevent them from rotting, most of them would last less than five years before they had to be replaced. Although there was a few sawmills in the area, the lumber sawn out was used in the construction of the numerous new buildings, the sawmill operators made more money by sawing out dimensional lumber than if they sawed out railroad ties. In addition to the railroad ties there was also a big demand for mine props, caps and timbers. Jacob Obenchain had a sawmill on the North Fork of the Poudre about three miles south of Livermore Park. New Mexico or eastern Arizona. Juniper is rot resistant, second best to pitch pine posts. Years ago on a flight to Mesa Arizona I flew over areas where whole section (square miles) of juniper forests had been harvested over the years. There were crews of men with axes, cutting down the juniper and loading the posts onto wagons. In the early 1900's these post were available in Fort Collins for around thirtyfive cents each. Of course in that era steel posts were not available. "Steamboat Buttes which from a distance presents to view all the characteristics of a steamboat, with upper cabins, chimney, pilot-house, etc., he passer-by pausing unconsciously to hear the bell and the familiar cry of 'all aboard' before it shall start away." 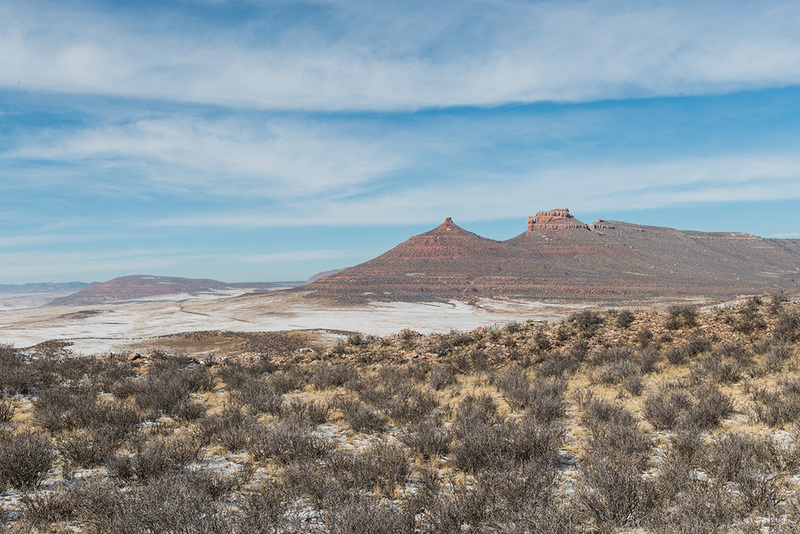 The photo above was taken from the top of Greyback Ridge, near the head of the Devil's Washboard. 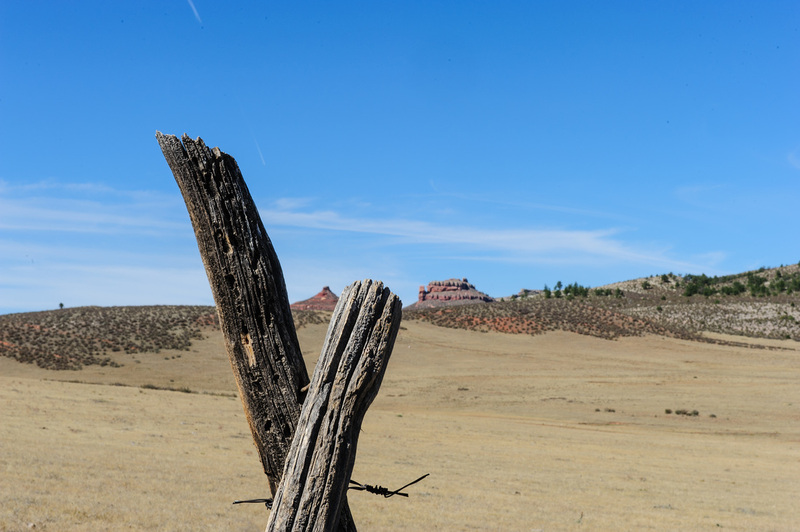 Red Mountain is to the left of Steamboat Rock (Butte) In the left center you can see part of a road - Fort Collins to Laramie City road which was also part of the Overland Trail, Cherokee Trail and War Road. Ansel Watrous wrote in his book " History of Larimer County" about a Mr. Parks drive a herd of cattle up the War Road north from the Arkansas River. This track was followed by the Cherokee's and was renamed the Cherokee Trail, the Overland Stage Company used the trail north from Denver later on, renaming it the Overland Trail. Evidentually this track was used historically by the indigenous people of the area, after the invasion from Europe and the introduction of horses it was used as a north-south route. Just to the south of where this photo was taken there is a large open grassy area that has over forty tee-pee rings from the horse era, along this ridge there are several smaller rock rings - pre-dating the introduction of the horse to the country.